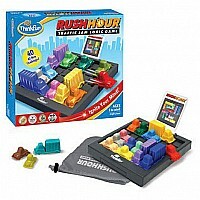 Voted one of Parents' Choice Best 25 Toys of 25 Years! Set up the traffic challenge and battle the gridlock as you slide the blocking vehicles out of your way to find a path for your red car to exit! This game features four levels of difficulty, allowing players to progress at their own pace. With 40 all-new challenges, it's even more bumper-to-bumper fun for all ages! Measures approximately: 8.88 x 2.50 x 8.00 inches..